Miracle Ikechukwu, 22, is a trained pilot who enjoys dancing and camping. At 24, he is single and plans to charm the ladies while in the House. The only pilot in the house believes fans will find him unique too. If he wins the prize money, he’ll get more aeronautic training and help his family. 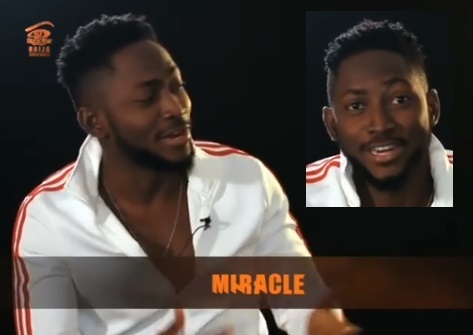 Other than that, Miracle is a model and has a dancing crew. He is a big fan of the show, he is funny and single. On day1, he kissed Nina before going to sleep and she enjoyed the moment. This pilot came to the house single as he claimed in his profile, but within house in the house, he had hooked himself a strategic partner, Biggie has tried separating them, but this has not affected their romantic lifestlye in the house, their ratings have since increased as the game crosses to the next phase that will require housemates to play as individuals as opposed to the #DoubleWahala bit. He was the first housemate to play the Big Brother game with partner in crime, Nina. He spent a greater part of today talking to Rico Swavey about the airline business plus the business opportunities in the sector.